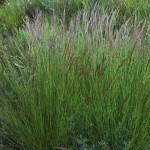 The rust-brown to purple flowers makes this lovely, tufted grass a very good companion plant in a mixed border. 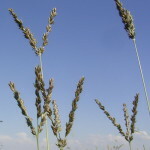 The whole plant is usually tinged with the reddish-brown colour that characterises the racemes. 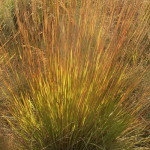 A hardy, densely tufted, perennial grass with slender leaves. The beautiful, shiny seed heads make this an attractive garden plant. 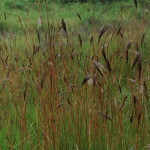 This reed-like, tufted grass grows in wet places but prefers a sandy soil. 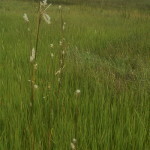 When the inflorescences are open, it almost give a “misty”, pink appearance. 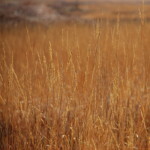 River grass prefers a wet spot and usually grows in sandy soils. 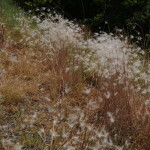 Spreads by means of creeping rhizomes. 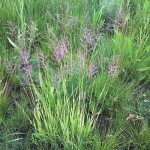 This tufted grass has very attractive, pink culms and flowers. 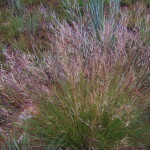 The lower leaf sheaths are almost purple. 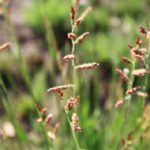 The relatively small size of the grass makes an ideal candidate for a small garden or a small section of a bigger development.